State Quarter Errors: Wisconsin State Quarter Error, Off-Centered Strike, etc. Everyone goofs once in a while. The U.S. Mint is no exception. The existence of a few State Quarter errors is not hard to imagine, especially when one takes into consideration the billions of them that were minted. Hiccups in the manufacturing machinery, compounded by the possibility of human mistakes, explains the inevitability of at least some defective State Quarters. The table below is to help collectors identify specific types of state quarter error coins. 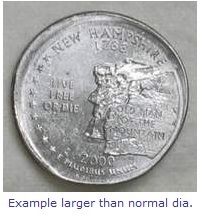 The types of errors on State Quarters range from minor to big-time screw-ups. There is a certain breed of coin collector out there who relishes the challenge of plucking State Quarter errors from circulation, and this section is devoted to these keen-eyed individuals. You guys help keep our hobby lively. Here, we discuss the most common and best known types of errors on State Quarters. By no means is this an exhaustive goof list, but it represents the most commonly talked about State Quarter errors. Happy searching, and remember, keep that magnifying lens handy! 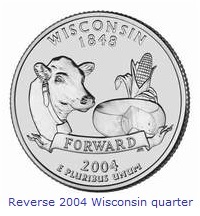 The Wisconsin State Quarter was released October 25, 2004. No one anticipated the excitement that was to follow a few months later, when an extra "leaf" was discovered on a few of them. United States Mint image. The presence of an extra cornstalk leaf on the 2004-D Wisconsin State Quarter has jazzed both collectors and non-collectors alike. When mass media headlines scream "Hidden Treasure in Your Pocket Change? ", small wonder that word of the Wisconsin State Quarter error has made its way into everyday conversation. Here's the lowdown: Wisconsin State Quarters were released amidst the usual fanfare in October 2004. Toward the end of December, some curious-looking Wisconsin State Quarters were discovered in Tucson, Arizona. These quarters appeared to possess an extra "leaf" added to the ear of corn on the Wisconsin reverse side design. Apparently, there are two varieties, one with the "leaf" pointing down, and the other with the "leaf" pointing upward. All of the "extra leaf" error quarters came from the Denver Mint. News of the oddity traveled fast. Some collectors and dealers began offering hundreds of dollars for a Wisconsin State Quarter error coin. Stories appeared in television broadcasts and general circulation print media, prompting even non-collectors to empty out their piggy banks for a second look. Near the crescendo of the frenzy, certain individual coins were selling for as high as $1500. After a few thousand of the coins were found, prices cooled off, but still, a collector can expect to pay hundreds of dollars on eBay for an Uncirculated Wisconsin State Quarter error coin. A regular Wisconsin State Quarter does not include something resembling an additional cornstalk leaf. United States Mint image. A Wisconsin State Quarter bearing what appears to be an extra leaf. This is the "Low Leaf" variety. Image courtesy of CoinPage. This is the "High Leaf" variety. Were these varieties the result of a die cut mishap, or the work of a meddler? Image courtesy of CoinPage. So what was the cause for this error coin? There was some controversy associated with this question. Some experts believed the raised features next to the ear of corn were the result of curved metal shavings becoming accidentally lodged in the coin die, which eventually got pounded into the die itself by the coin striking action, leaving a gouge in the die. As more coins were struck by the same die, coin metal flowed into the gouged recess, giving the coin an appearance of another leaf. Those who subscribe to this theory also point out that these so-called leaves fall far short of proper design definition, are awkwardly placed, and lack texture. Other observers, equally knowledgeable of the coining process, speculated that this was no mistake at all, that the extra leaves were added deliberately in an unauthorized manner by someone inside the Denver Mint. The basis for this theory is that it seems too coincidental that two random dies (i.e. one for each "extra leaf" variety) independently acquired gouged recesses in just the right spot to give the appearance of an added leaf. The odds of such an event occurring on two different dies are astronomical, they argued, and are far more likely attributed to the intentional efforts of an amateur engraver. In the August 2007 issue of The Numismatist, the official publication of the American Numismatic Association, collector Chris Pilliod, who is a metallurgist by profession, published the results of a scientific investigation into the cause of the extra leaves. The evidence he gathered, much of it through scanning electron microscopy, led him to conclude the "error" was done intentionally. The window of opportunity was the time between die hubbing and final heat treat, when the die metal is soft enough that someone can alter the design with a punch tool and hammer. High magnification revealed metal flow evidence consistent with theory, while eliminating other possible causes. We are still left to wonder why someone would do such a thing. How many of the "error" coins exist? An investigation revealed Denver Mint operators noticed the Wisconsin defects early on and pulled the offending dies from service. Based on the slight amount of wear on the dies at their retirement, it is estimated that 20,000 of the Low Leaf and 15,000 of the High Leaf varieties made it into a massive coin hopper, and were soon bundled into rolls alongside standard Wisconsin quarters and escaped to the public. Years from now, will anyone be excited about owning a Wisconsin extra leaf variety? Will collectors eagerly seek them out? Who knows, but one is reminded of a couple of other mishaps at the Denver Mint long ago that to this very day cause racing hearts and sweaty palms amongst numismatists: the 1922 "No D" Lincoln Cent and the 1937-D three-legged Buffalo Nickel have both earned a high place in coin lore, with impressive value increases over time to prove it. Perhaps a similar, lofty status awaits the 2004-D Wisconsin "error" quarter. 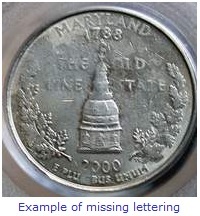 The lettering on this 2000 Maryland State Quarter lacks detail. A die partially clogged with grease was most likely responsible for the miscue. Image courtesy of CoinPage. This refers to a coin that is missing lettering, numeral, or a portion of the design. It is easy to notice and is probably the most frequently encountered State Quarter error. Generally, these errors result when manufacturing grease or other debris is packed into the a recessed area of a die. When the die strikes strike a planchet, coin metal cannot flow into the filled recessed area of the die, resulting in a coin lacking detail in the effected area. Most die-filled errors are common and do not add a premium value to the coin, except is the most extreme of examples. Collectors should be wary of anyone attempting to sell ordinary die filled error State Quarters for more than a few dollars. 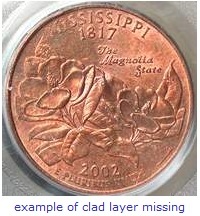 The reverse clad layer of this 2002 Mississippi State Quarter is missing, resulting in the exposure of the inner copper core, upon which the design was struck. Image courtesy of CoinPage. One easily observed State Quarter errors occurs when one side of the coin is copper colored. This happens when one of the coin's outer layers is missing. Every clad coin, which includes State Quarters, is comprised of three layers of metal. Both outer layers are made of an alloy consisting of 75 percent copper, 25 percent nickel. It is this alloy that gives clad coinage the silver-like appearance. The center layer consists of pure copper. Occasionally, one or both of the outer layers separate from the copper core because of a failed bond between layers. When one of the outer layers peels off, the copper core is exposed, and it is this copper core that is struck by the die, thus imprinting the coin design. State Quarters missing a clad layer are somewhat valuable. Collectors will pay anywhere from a few hundred dollars to nearly $2000, depending on the statehood design and grade of the coin. Collectors are especially eager to locate State Quarters with the reverse side clad layer absent. At these prices, it may be worth your trouble to purchase Washington Quarter rolls. Who knows, you might just get lucky! Seldom does a coin having a larger than normal diameter escape the Mint's quality control net. This abnormality can be caused by striking on an oversized planchet, but more frequently, it is manifested through a collar die malfunction, resulting in something known as a broadstrike. This 2000 New Hampshire vividly depicts a broadstrike. Note the oversized diameter and irregular shape. Image courtesy of Woodstock Consolidated Services. The collar die is a circular-shaped device surrounding the lower die. It serves two purposes: applies the reeded or plain edge, and halts the metal of the planchet being struck from flowing beyond the perimeter of the die. For some reason, if the collar die is prevented from being in the correct position during the striking action, the metal flow extrudes beyond the perimeter of the die, resulting in an oversized, irregular shaped coin. Broadstruck coins are tough to find in circulation, since most of them are caught at the Mint. The more obvious the error, the more valuable the coin. The malformed broadstrike example shown at left is capable of bringing over $100. 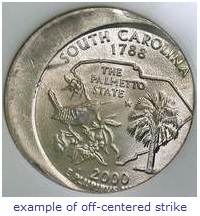 Pictured above: 2000 P South Carolina State Quarter 25% Off-Centered Error. Image courtesy of CoinPage. If a planchet does not fully align with the dies at the time of striking, the result in an off-centered strike. Every off-centered coin is different: the percent off-center and position of strike are the variables. Slightly off-centered coins are relatively common error coins. Off-centered coins with date and mint mark intact are more valuable than coins lacking these. Dated State Quarters with significant off-centered strikes, say 25% or more, can be worth at least $100. Extreme off-centered State Quarter errors (80-90%) can command as much as $300 from hobbyists specializing in error coins. Picture yourself approaching a vending machine. Its a hot day, and you can hardly wait to enjoy the sensation of a cold soft drink soothing your parched throat. You reach for some pocket change and begin anticipating that magical moment all the more. Now you start tallying the coins for the requisite total... 10 cents... 20 cents... 25 cents... 50... huh, what the heck is this? Aaaargh... you grimace in frustration, realizing that "quarter" isn't really a quarter after all. It's nothing but a blank! You slink away from the vending machine as gracefully as possible, hoping to avoid eye contact with the amused onlooker chuckling at your predicament. If something like this has ever happened to you, you're not alone. 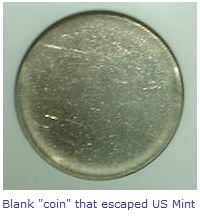 If the Mint had to admit how many blank "coins" escaped their fortress walls, somebody might loose their job. This clad quarter coinage has reached the planchet stage. The distinct rim is evidence of this. For some reason, this planchet didn't make it to the coining press. Image courtesy of Munroe Coins & Collectibles. So how did our hypothetical vending machine customer above get stuck with a blank? Let's review the clad coining process. All clad coinage, which includes State Quarters, start out as a coiled strip of tri-layered material (outer layers are a 75% copper, 25% nickel alloy bonded to a pure copper center layer). The thickness of the coiled material equals that of the finished coin. The coiled strip is unrolled and fed into a punch-out blanking press. Round dies pierce through the strip, ejecting a round blank with each penetration. Error specialists will pay more to acquire a blank escaping into circulation at this stage of the manufacturing process. After leaving the punch-out press, the blanks are processed through a machine called the upset mill. The action of the upset mill squeezes the blank near the periphery, causing a raised rim to form on the very edge. When the rim is formed, the object is technically termed a planchet. Many numismatists use the terms "blank" and "planchet" interchangeably, but in a very strict sense, there is a difference. As we have already learned, this distinction is crucial to the error coin collector. There are numerous opportunities in a fast-paced manufacturing environment for a blank or planchet to elude even the most conscientious operator. There are billions of coins struck every year, so its no surprise that thousands of these goofs have sneaked out of the Mint on the Brinks truck. Remember our frustrated soft-drink buyer? He needn't have gone away thirsty. Most vending machines treat blanks at full face value, so he could have quenched his thirst after all. On second thought, perhaps his best choice would have been to put it on eBay and get $5-10 for it. The repeated pressure of striking coins can cause cracks in a coin die, resulting in raised lines of metal appearing on the face of the coin. Usually small, the raised lines are formed when coin planchet metal flows into the open cracks at the time of striking. Die cracks are common State Quarter errors. Because each statehood pattern is minted for a short period of time (10 week average), less than normal attention is paid to the possibility of die cracking, both at the design level (i.e. "coinability") and on the manufacturing floor. Consequently, cracked State Quarter dies have been known to produce many thousands of coins before they are retired. Under repeated stress, coin dies can easily crack. As a coin is struck, coin metal flows into the die crack opening, resulting in what appears as raised lines. Above are three examples of lines created by a small crack in the coining die. Image courtesy of Mike Monteau. State Quarters with large, easily visible cracks carry more value than quarters with less obvious cracking. Generally speaking, die cracks do not add appreciably to the value of the coin. Not long after the first State Quarters were released in 1999, a few of them were classified as error coins due to a phenomenon known as rotated die error. This discovery should not have surprised anyone, as many examples of this error have occurred throughout U.S. coining history. So exactly what is a rotated die error? Here is how you find out. Take a State Quarter (or any other coin for that matter), and grasp it between your thumb and an opposing finger at the 3 and 9 O'clock positions, with the obverse side (i.e. "Heads" side) up. Make sure the coin is vertical, with George facing directly to the left. Now, with your other hand, flip the coin over, but maintain your hold on the coin. If the reverse design is right side up, everything is normal. If it is angled or perhaps even upside down, someone goofed when the obverse and reverse dies were set up in the coining press. The dies are supposed to be oriented to achieve the normal look described in the test above. If one of the dies is rotated, then the angled effect on the reverse side appears, relative to the obverse. When an upright quarter is flipped over, the reverse side should be upright too. If one of the dies was rotated prior to striking, the reverse image will appear angled. The example above illustrates the effect of a slightly rotated die. US Mint images. Rotated die errors are relatively common. The degree of rotation varies from 5 to 180 degrees. Coins misaligned by 180 degrees are the most valuable. State Quarters in top Uncirculated condition with 180 degree rotated die errors are valued in the neighborhood of $50.00. Anything less than 5 degrees is considered acceptable by Mint quality standards and is not considered an error.